You never know what Sarah Beth Durst is going to do next. Fairy tales mixed with science? Vampires and unicorns? Gods taking over human bodies? Creepy carnivals? She’s done all of that and more, and with The Lost, Durst begins another story that, just like her previous novels, is completely different from what has gone before. Lauren is a character who is easy to root for; she’s flawed but sympathetic, and her situation is so confusing and creepy that the reader really feels for her predicament and wants to get to the bottom of the mystery. The setting is ingenious and Durst explores all sorts of possibilities in terms of what kinds of things might be lost, and thus available to Lauren while she’s there. Later the novel takes a poignant turn, and there’s also a palpable sense of “Lost feels more real than the ‘real world’” that appears late in the book and works really well. Unlike most of Durst’s previous works, The Lost is the beginning of a series. Durst resolves one major plot but leaves many mysteries to be solved, and the reader wanting more. I look forward to reading The Missing, scheduled for November of this year. 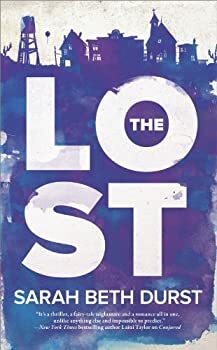 The Lost is billed as Durst’s first foray into adult fiction, with her previous books having been categorized as YA. So far, other than the heroine being older and having started a career, it doesn’t “feel older” than the other Durst books I’ve read, especially since Lauren is quickly separated from most of this daily-life stuff and dropped into a world where it doesn’t really matter how old she is, and you don’t think about it much. I wouldn’t hesitate to recommend it to a teenage reader on the basis of content (the romantic subplot is chaste to this point), though adult readers will also enjoy exploring Lost’s mysteries. Publication Date: June 1, 2014. Brilliantly riveting. * Thought-provoking and stirring. ** Award-winning author Sarah Beth Durst has been praised for her captivating novels that merge the darkly imagined with very real themes of self-discovery and destiny. In The Lost, we’ll discover just what it means to lose one’s way…. It was only meant to be a brief detour. But then Lauren finds herself trapped in a town called Lost on the edge of a desert, filled with things abandoned, broken and thrown away. And when she tries to escape, impassible dust storms and something unexplainable lead her back to Lost again and again. The residents she meets there tell her she’s going to have to figure out just what she’s missing—and what she’s running from—before she can leave. So now Lauren’s on a new search for a purpose and a destiny. And maybe, just maybe, she’ll be found…. Against the backdrop of this desolate and mystical town, Sarah Beth Durst writes an arresting, fantastical novel of one woman’s impossible journey…and her quest to find her fate. How I have missed Durst’s books is beyond me. I dropped a bundle on 3. I’ll also check this one out. I don’t think I have come across any good stand-alone fantasies for awhile so I will be digging into some earlier Durst works before moving on to another series. I know. Every time Kelly reviews one of her books, I think “I’ve GOT to read her” but so far I haven’t managed it, mostly because there are always so many review copies in my TBR pile. I think The Lost sounds great. I’ll put it on my list and hope it makes its way up the stack. Wow, how have I missed her so far? She sounds great, and so does this book.